ST. GEORGE — The official license application for the controversial Lake Powell Pipeline was submitted to the Federal Energy Regulatory Commission Monday, and groups opposed to the pipeline are weighing in. 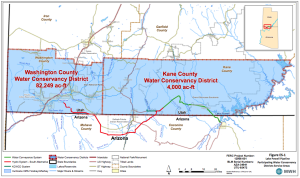 The proposed pipeline would stretch nearly 140 miles and carry up to 86,000 acre-feet of water from Lake Powell to Washington and Kane counties, water which proponents say is needed to support future population growth in Southern Utah. Opponents say the pipeline is not needed and would be prohibitively expensive. The next step in the process is a review by the Federal Energy Regulatory Commission, Division of Water Resources spokesperson Joshua Palmer said. The agency could then reject the pipeline proposal, ask for more information or move forward with an environmental impact statement. The proposal’s four alternatives include several different routes for the proposed pipeline which could significantly affect the size, scope and cost of the potential project, a Division of Water Resources press statement said. 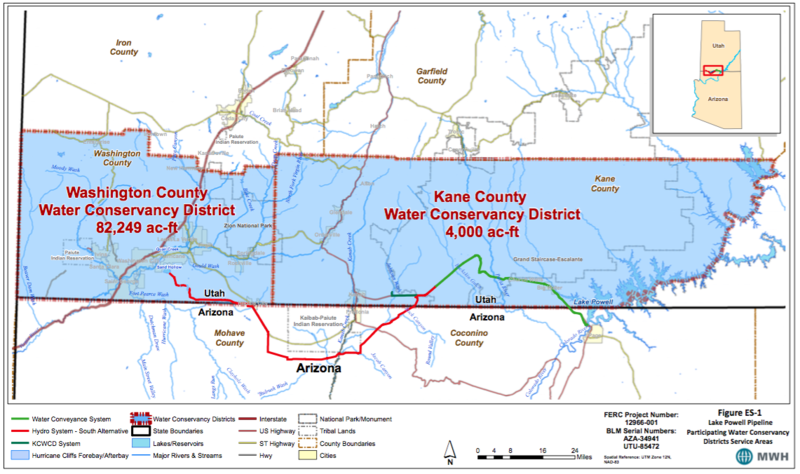 Other alternatives for providing water to Washington and Kane counties without using water from Lake Powell are also considered in the proposal. Conserve Southwest Utah, a local conservation group formerly known as Citizens for Dixie’s Future, opposes the pipeline and said the water district is using unrealistic population forecasts, outdated water use data and unreasonably low estimates of the cost to justify the need for the pipeline. The group also believes the Colorado River is already overallocated and that depending on it for future water is not sustainable. “Investing billions of dollars into a project that may not produce water in the future is a financial risk not worth taking,” information from Conserve Southwest Utah’s Lake Powell Pipeline Web page said. State officials may also be having second thoughts about large projects like the Lake Powell pipeline. In December 2015, the 2017 fiscal year budget proposal unveiled by Gov. Gary Herbert recommended several conditions should be met before the state would be willing to consider funding billion-dollar projects like the pipeline. Based on U.S. Geological Survey data, Utah has the highest per capita municipal and industrial water use in the nation, Herbert said, and the budget proposal recommends better tracking of water use, stronger conservation measures, independent validation of project costs and increased transparency and local voter engagement. The pipeline application comes just days after the federal government announced it is considering cuts to Lower Colorado River water users in Arizona, Nevada and California, Utah Rivers Council Executive Director Zach Frankel said in a press statement. The cuts could reduce water deliveries by hundreds of thousands of acre-feet for these southwestern states. “It’s madness that America’s most wasteful water user is proposing to divert more Colorado River (water) while water cuts are being considered for millions of users downstream who’ve been conserving water for decades,” Frankel said. The Lake Powell Pipeline would pump 28 billion gallons of Colorado River water 2,000 feet uphill across 140 miles of desert to water the lawns of St. George, Frankel said. However, the Washington County Water Conservancy District disputes those figures. “Washington County’s residential water use is one of the lowest in the state of Utah, despite its location in the most arid and hot part of the state,” water district General Manager Ron Thompson said in an emailed response to a request for comment. Landscapes in Southern Utah are more efficient than in other parts of the state, and many of the newer neighborhoods and master-planned community associations have turf-free landscapes, Thompson said. Because every municipality is different, Thompson said, it’s hard to say that one city is more water efficient than another by simply looking at water-use numbers. In addition, Las Vegas measures water use differently than Washington County, which skews the comparison. Cost estimates for the pipeline vary. Last fall, a group of 21 Ph.D. economists from the three major universities in Utah estimated the cost at $1.4 billion-$1.8 billion. The study concluded that the project would require at least 500 percent increases in water rates and 120 percent increases in impact fees to repay the debt and would burden every man, woman and child in Washington County with as much as $781 of debt every year for the next 50 years. Frankel called the Lake Powell Pipeline “a con game led by hucksters seeking $2 billion of taxpayer money” and said the Utah taxpayer will be the victim. 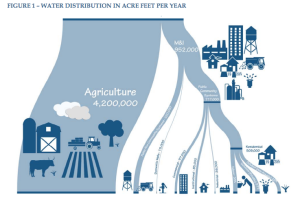 The Washington County Water District refutes these claims, saying the economists’ study is flawed and based on faulty assumptions, including inaccurate or outdated population projections, water supply availability and use, agricultural water transfers and more. 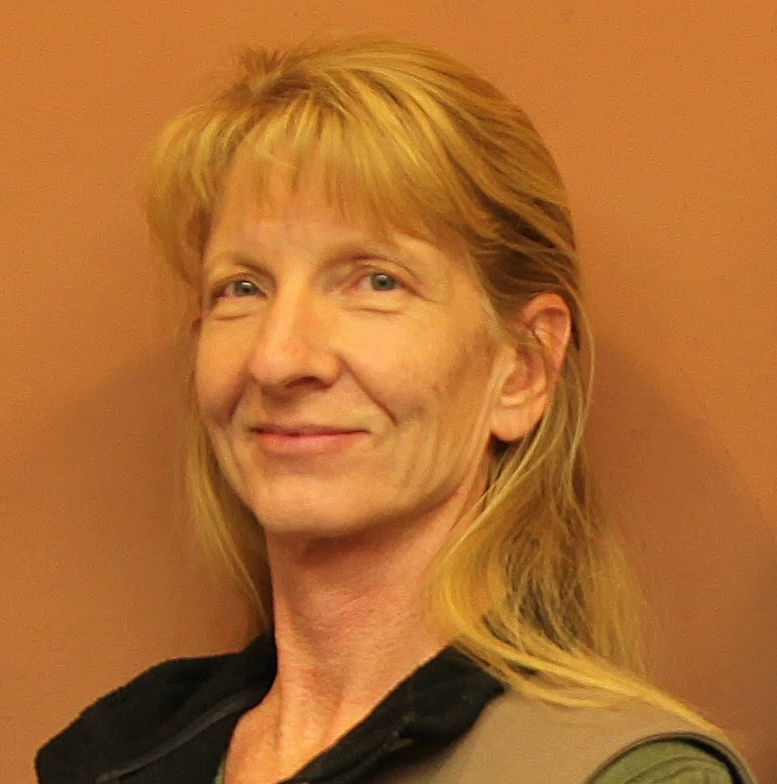 The study ignored the provisions of the Lake Powell Pipeline Development Act of 2006, Thompson said, which calls for the repayment of project costs once developed water is delivered to the districts over a long period of time. The interest rate has yet to be determined but would be in line with other public contracts. The assertion that current county residents would bear the full cost of the pipeline that will not begin delivering water for about 12 years is a “scenario without any basis in fact or reality,” Thompson said. The study would have Washington County residents paying interest on the project before the funds have been obtained and spent, Thompson said. This artificially inflates costs, and those figures were used later in the study to make the conclusion that unsupportable cost increases would need to be borne by local water users. The same fallacy is applied to the study’s elasticity calculations, rate increases, impact fee requirements and other factors, Thompson said. Frankel said pipeline proponents have no viable plan to finance the $1.4 billion to $3.2 billion pipeline, even after eight years of study. However, Thompson said the Lake Powell Pipeline Development Act specifies that water users will have up to 90 years to completely pay off the pipeline. The district will pay for the water in blocks as it is needed and used, district spokesperson Karry Rathje said in an earlier interview. It is a series of smaller repayments with interest, rather than a single loan, and most blocks will have a 50-year repayment. Thompson also said it is premature for the district to have a final financial model for repayment before a decision is reached that would allow the project to be built and specify how the project will look and operate. Once a record of decision is received, Thompson said, the district will work with the state and consultants to create a final design, cost estimate, financing terms and ultimately a repayment plan. The information will be shared with the public before the district commits to build the pipeline. Critics of the pipeline also point to the inflation of water-use data by the Division of Water Resources as one of many reasons why the pipeline isn’t necessary. Frankel said many inexpensive alternatives are being ignored. These alternatives to the pipeline are documented in a May 2015 legislative audit, Frankel said, which found that water conservation is not being implemented as aggressively as many other western cities — including Las Vegas – and that the area has an abundance of unused agricultural water that could be converted to municipal water supply. However, Thompson said the legislative audit did not consider alternatives to the pipeline or specifically compare Washington County’s conservation progress to other cities. “Had the report included a comparative analysis, Washington County would be reported as one of the lowest residential water users in the state having achieved a 26 percent reduction in use from 2000-2010 – (latest data available) compared to the state average of 18 percent,” Thompson said. The district does believe that some agricultural water will be converted in the future, Thompson said, although currently it is not “unused” but rather being used for agricultural purposes. The people that are pushing this through are the same people that tell us that we need to live within our means when it comes to government spending. Why can’t we live within our means as a community? Why is it a foregone conclusion that this county will house a half million people in 30 years? Do current residents really want this community to get that large? I understand that a certain amount of growth is needed to provide jobs, but there has to be a way to decide how big we want this community to be before nature decides for us. A relatively small percentage of Washington County residents will benefit from this. The rest of us will be left with a community that is too crowded and a far cry from the smallish town we have today. A half a million people here? HaHa! Either the whole city will need new roads or St George news will have to expand ’cause they will be busy reporting car accidents. This is where the emphasis should be taking place; this would insure our water supply much longer, and, at the risk of sounding like a B and R, we DO NOT need a population of a quarter of a million people, not now, not ever. Thompson keeps spewing the same misinformation that he’s been handing out for ten years. Population figures change (down), water usage changes (down), cost keeps going up but the answer is always “we have to have the pipeline or this county will face dire consequences and we will have to ‘export’ our children.” If the need for the pipeline is based on population projections and water usages, how can one in all honesty keep offering same old argument over and over? There will be an end to the LPP water, too, but Ron will be long dead with only his name on the project to remind people of the debt he left them with, not the water. Ron and other leaders have their rose-colored glasses firmly on their noses while the rest of us see the future vision very clearly. His comments about the state audit are completely wrong! Here are some excerpts from the May 2015 state audit of the Division of Water Resources (pipeline planners) that shows some of the concerns expressed and challenges some of Ron Thompson’s assertions. “Unfortunately, the accuracy of Utah’s water use data is not commensurate with its importance to the division’s planning effort and needs to improve. Division staff were unable to adequately document their methodology or provide source documentation for the data used in their baseline 2000 M&I report. According to one division manager, “some staff members in the past just entered M&I use data into a spreadsheet as they would talk to people on the phone.” Therefore, the manager reports the source data was not documented. Division management stated that while they trusted staff to enter the correct data, the accuracy of the study depends on the ability of local water system staff to report the data accurately. Because division staff were unable to document the source of the data used in their baseline study, we could not verify the accuracy of the reported data. Additionally, the methodology used was also difficult to document. For example, the division requires its staff to estimate the amount of secondary water used by some entities. However, without documentation of the methodology, we were unable to verify whether a reasonable and consistent method was used to estimate secondary water use. In addition, without proper documentation, the division’s managers and supervisors would have been unable to verify if staff followed consistent procedures as they gathered the data. According to the U.S. Geologic Survey, Utah has the highest per capita water use in the nation. 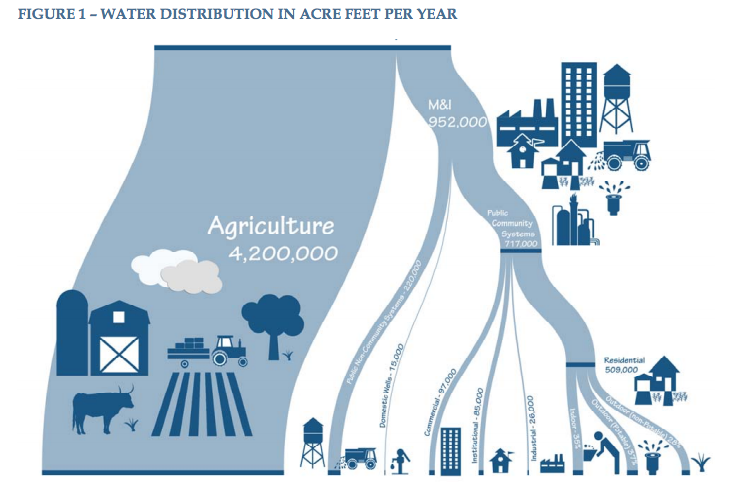 Figure 3.3 compares M&I and residential water use in Utah to that of other western states. The Southern Nevada Water Authority, which serves the Las Vegas region, has a goal to reduce water use to 199 by 2035. In contrast, the communities in Southwestern Utah, which have a climate that similar to that of Southern Nevada, have a goal to reduce water use to 292 gpcd by the year 2060. There is much work to be done to improve our water data collection upon which to base serious decisions such as the LPP and determine exactly how much is being used, where improvements can be made and how to make what we have go further. Thompson and leaders who are willing to spend our money extravagantly should be challenged and voters should consider replacements for leaders who are making poor money decisions using our tax dollars.